Nebraska looked a little bit more like the team Huskers fans know and love on Saturday night as the Huskers bounced back from an opening-night loss to No. 7 Florida to sweep No. 18 Oregon at the VERT Challenge. The Huskers beat the Ducks 25-21, 25-21, 26-24 in front of 8,135 fans at the Devaney Center. The Huskers committed 30 attack errors against the Gators, hitting .126. On Saturday, Nebraska committed just 12 attack errors and hit .246. Foecke was a force for the Huskers and played an incredibly clean game, finishing with a match-high 15 kills and zero errors for a .375 hitting percentage. She chipped in 11 digs for her second straight double-double. Foecke was named to the VERT Challenge All-Tournament Team after the match. She was joined on the team by Oregon's Willow Johnson, Florida's Thayer Hall and Allie Gregory and Texas' Mikaya White, Sydney Peterson and MVP Morgan Johnson. Freshman middle blocker and birthday girl Callie Schwarzenbach added six kills on nine swings without an error after committing four errors against the Gators on Friday. “Callie is such a physical player, but she’s one of the most humble and quiet people you’ll ever meet,” sophomore middle blocker Lauren Stivrins said. Senior libero Kenzie Maloney posted a match-high 16 digs to go with four assists and Hames, the freshman setter, totaled 35 assists, nine digs and an ace. Friday’s sloppy play carried over into the first set on Saturday as Nebraska found itself down 6-1 before it even recorded a kill. Even the video board over the court went dark. Nebraska settled down and responded with a 6-3 run to pull within two but Oregon stretched its lead out to six, 15-9, at the media timeout. Much like on Friday, the Huskers struggled mightily to terminate as the Ducks held an 8-4 edge in kills midway through the set. Nebraska picked it up after the break with an 8-3 run to pull within one before Oregon ripped off two straight points, drawing a timeout from Cook. From that point, Oregon fell apart as Nebraska put together a 7-0 run with Hames at the service line to earn several set points. Oregon ended the run with a kill but served into the net to give Nebraska a 25-21 win. Oregon narrowly out-hit Nebraska .119 to .105 but the Ducks committed seven service errors to give Nebraska the win. After bringing freshman outside hitter Capri Davis off the bench on Friday midway through the match against Florida, Cook gave her the nod first over sophomore Sami Slaughter. However, after just one kill and three errors on 12 swings for Davis, Cook went back to Slaughter trailing 6-5 in the second set and the Huskers took the lead with a 5-1 run. Nebraska stretched its lead out to six with a 3-0 run including back-to-back kills by Slaughter. Oregon pulled within three a couple of times but got no closer as Nebraska closed out the set at 25-21 thanks to another errant serve by Oregon on set point. Nebraska hit a blistering .412 in the set with just two attack errors. 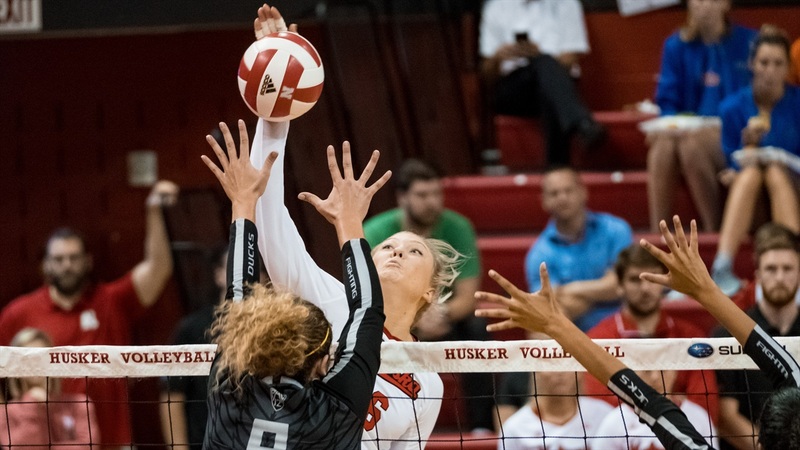 Two kills by Foecke sandwiched around an ace by Hames got the Huskers off to a 3-0 start in the third, Oregon countered with a 4-0 run and Nebraska one-upped the Ducks with five straight points in response. Oregon called a timeout trailing 8-4. The Ducks regrouped and pulled within one a few times, then tied it a few times then took the lead at 18-17 before Nebraska took a timeout. The Ducks misfired on the serve out of the break but Lindsey Vander Weide notched three straight kills to put Oregon up 21-18. Nebraska countered with a 4-1 run to tie the match capped by middle blocker Lauren Stivrins’ second career ace, a beauty of a serve that just barely cleared the net and dropped sharply. Stivrins had three service errors on Friday. After going back and forth a few times, Nebraska made the winning plays — something they didn’t do against the Gators — and closed out the match with a 3-0 run. Sitting at 1-1 after the first weekend, Nebraska has a lot to review and learn from heading into the next match. However, Foecke did say she’d love another crack at the Gators, who dropped a five-set match to No. 3 Texas on Saturday afternoon after leading 2-1. The Longhorns finished 2-0 at the VERT Challenge. The Huskers will get back at it next weekend for the Americas Players Challenge. The action gets started on Friday with Nebraska’s first match set for noon.